SFCave is a remake of the old arcade games dominated by simple but fast graphics. In the game you control a spaceship and try to fly through a cave blocked with obstacles. 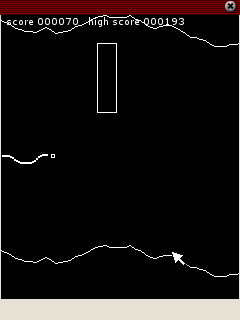 Your aim is to avoid these obstacles because as soon as any obstacle or the cave walls are hit the game is over. This is made even harder by gravity which constantly pulls the ship down to the ground. In an additional level scoring is achieved by flying as close as possible to the cave walls. This game has a few good and bad points. Let's start with the good ones: The game offers three different game types in one game. Also the graphics is quite fast. Furthermore, scores and highscores make the game more interesting to play. However, despite this good approach there are things which will keep you from playing. First of all, the graphics is not up to date anymore. 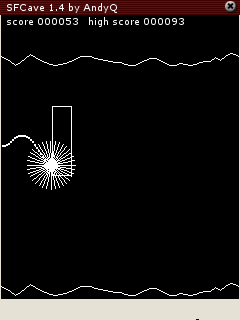 A white dot moving in white lines ending in a explosion of white lines is not state of the art graphics. Despite the three game types the game gets boring quite fast, as there is no variation. You simply fly and try to avoid the square obstacles. Furthermore, the game is quite frustrating as it is hard to impossible to avoid the barriers at some time and there is nothing to protect you. Once you are too low to fly over an obstacle you see it coming but you are lost. As the game is free, give it a look if you have played these type of arcade games decades ago, otherwise you will probably not need to install it.